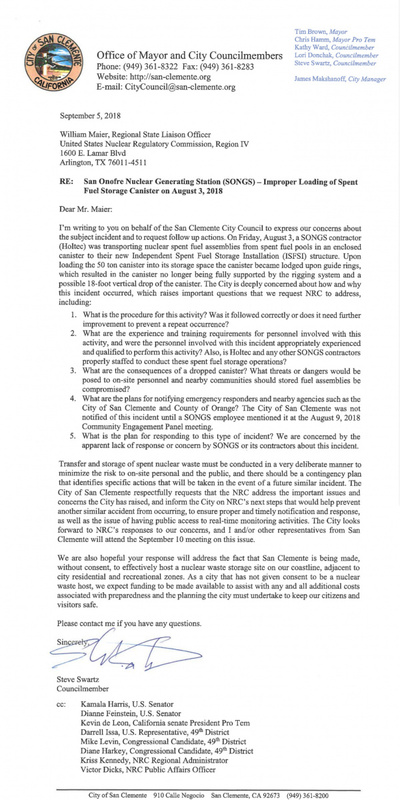 Signatures on this petition represent concerned citizens that endorse the attached letter to the Nuclear Regulatory Commission from San Clemente City Council. We expect a public hearing by the NRC to review findings from their recent inspection of San Onofre's "serious near miss" before Edison is allowed to proceed moving nuclear waste. We also insist on having a contingency plan in place for the possibility of similar incidents in the future before work resumes. Finally, we expect to have publicly available on-site radiation monitoring at all times. (High radiation readings recently taken near the oldest canisters on site by independent sources are worrisome, calling for an immediate explanation by independent nuclear radiation experts). THE NRC MUST REQUIRE EDISON TO STOP ALL MOVEMENT OF NUCLEAR WASTE UNTIL THESE REASONABLE REQUESTS HAVE BEEN ADDRESSED!